We are now pleased to supply LPG to homes and businesses in Denbighshire and surrounding counties in North and Mid Wales. Due to our great customer care and the cheapest LPG prices on offer we have seen a rapid increase in customers requiring our services in Denbighshire, all its major towns of Denbigh, Llangollen, Prestatyn, Rhyl, Ruthin and Saint Asaph as well as all the villages and rural areas throughout the county. Our head office is in Preston and we have LPG tankers and drivers based at Ellesmere Port just a stone’s throw from the M56 and M53. As such, we have great access to Denbighshire’s main roads ensuring that deliveries to our Denbighshire based customers are as reliable as can be. Recent rule changes allowing LPG home owners to switch their LPG supplier has seen a substantial increase in domestic customers choosing us to supply their LPG. We give great service and our prices are the lowest you will find so contact us to discuss how we can improve on your LPG supply and the price you pay. 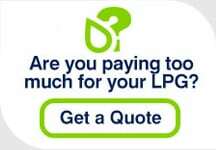 Changing your LPG supplier is now a quick, easy and free process and as one of the cheapest suppliers available we are confident you will be delighted with the price we can give you. We are experienced in the transfer of LPG supply to residential developments that share LPG storage tanks and where LPG use is measured by a meter. Like many other rural areas off the national grid, Denbighshire seems to be a location where there are many LPG metered estates. Farmhouse and barn conversions for domestic homes being good examples where a metered LPG supply is the most cost effective. As most farms, etc. tend to be in rural locations they are not served by mains gas, LPG is the ideal alternative fuel for these communal developments. Sharing LPG equipment is the most effective infrastructure to supply LPG to properties located close together. LPG is a versatile and cost effective fuel for businesses that are not able to connect to the national grid. Customers of ours use LPG to heat their premises, cook with a real flame, run Forklift Trucks and dry crops as well as many other industrial and agricultural uses. Our experience within the LPG industry is built on finding solutions for businesses, great customer service and providing the most competitive LPG prices. Denbighshire LPG users can find more general information on the following pages: Domestic LPG transfers, Metered LPG transfers and Commercial LPG transfers.